DRO PROS 1-2-3 Value! 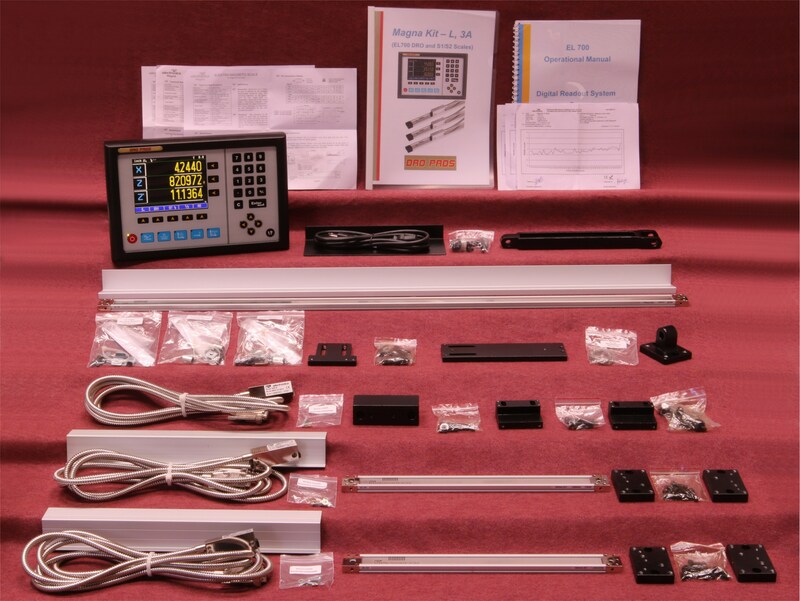 - Easiest to use Digital Readout - DRO Kits start at only $499 - Industry's best warranty! Our Kit and Part Prices always beat Heidenhain Newall Acurite Sargon & Fagor! We speak English - We answer our phones - FREE shipping on magnetic kits! Welcome to DRO PROS, the Digital Readout Experts. 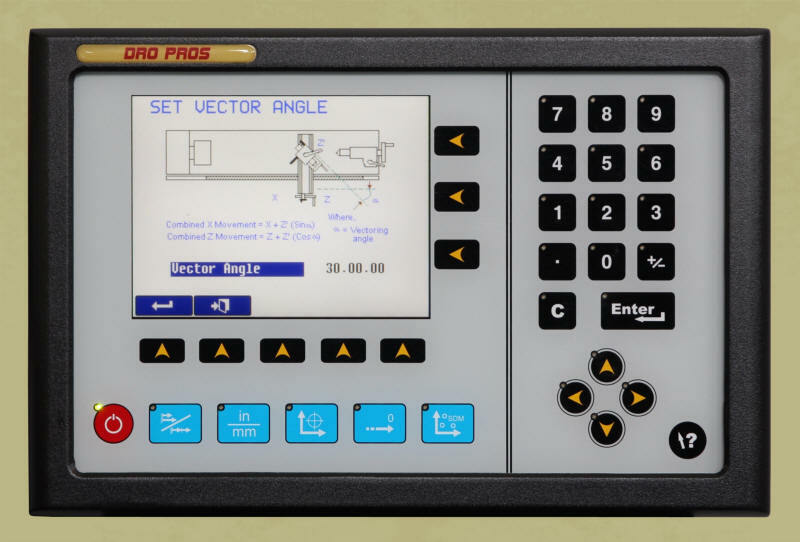 If you're looking for a lathe, a milling machine, or a digital readout (DRO) system, you've come to the right place. The longer you look around the internet, you'll soon find that we provide the best customer service, the best product, and the best value for your money. We specialize in producing videos for our products that show you step by step how to choose, install, and operate them. We have hundreds of photos showing our customers installations, located HERE. But best of all, we actually talk and spend time with our customers. Confused or don't know what to buy? Call us toll free at (877) 628-6028 and talk to any of our knowledgeable sales staff and get the right machine or digital readout today! 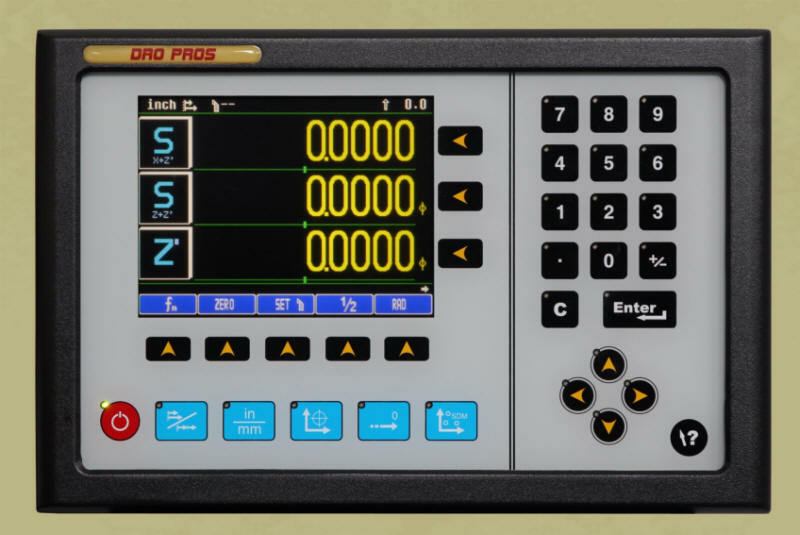 - We now carry mills and lathes with digital readouts pre-installed. They use magnetic scales and LCD displays, all at an incredible price! Check out our mills and lathes page. 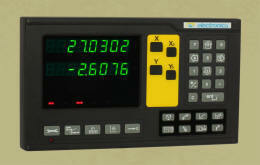 - Our newest offering in mills is the VM18, both with and without a digital readout pre-installed. Starting at only $1,174! In general, there are two main factors to consider when buying a DRO. First is scale type, and second, is display type. DRO PROS sells both glass and magnetic scales. Glass is popular because it's the least expensive, but it can (and frequently does) get contaminated from oil and debris. Magnetic scales are superior because they are coolant and dust proof. Further, they are slimmer, and can be cut to any length you want, making installation much easier. Glass Scales - Inexpensive, but not coolant or dust proof. Cannot be cut to length. Only available as "Incremental" style. Magnetic Scales - Coolant and dust proof, they can't be contaminated. Can be cut to length. Available in "Incremental" or "Absolute" style scales. Absolute scales are the best, because they never lose position, even if power is lost or the machine is moved with the power to the display turned off. Capacitive Scales - You may see inexpensive digital scales being sold and/or marketed as magnetic, when in fact, they are not. For example, most digital calipers use capacitive linear encoders. 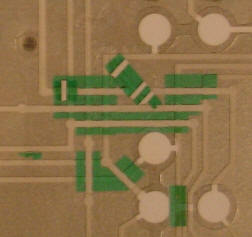 The downside to capacitive technology is that it's susceptible to error when exposed to oils, dirt or low temperatures. Unfortunately, unscrupulous resellers often refer to their scales as magnetic, when in fact, they are not. More information can be found on Wikipedia HERE. 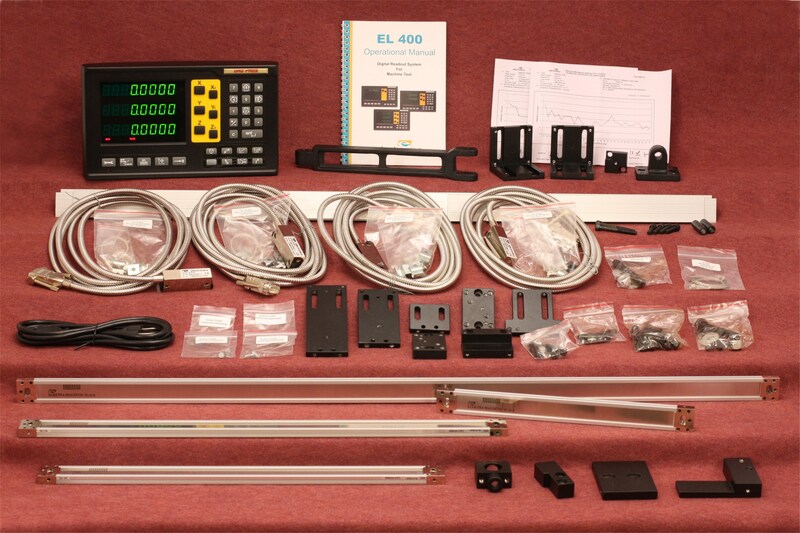 DRO displays are available in 1, 2, 3 and 4 axis kits. The screen is either an LED or LCD type. 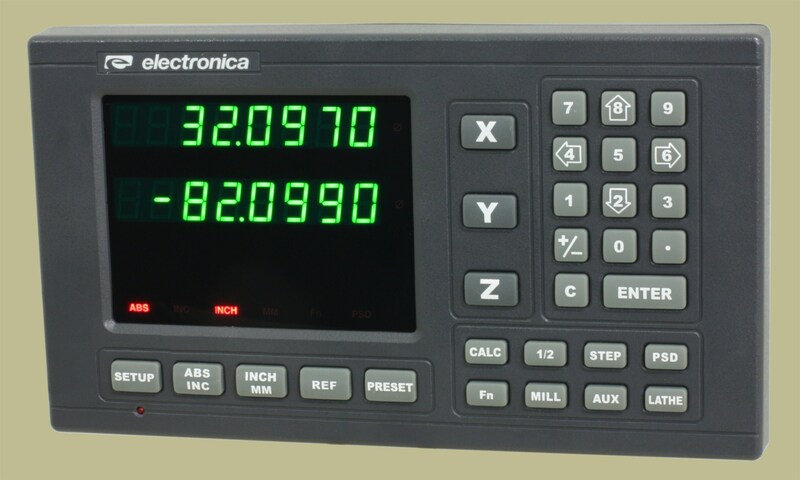 LED displays can only show numbers (like a calculator), and are therefore less expensive. 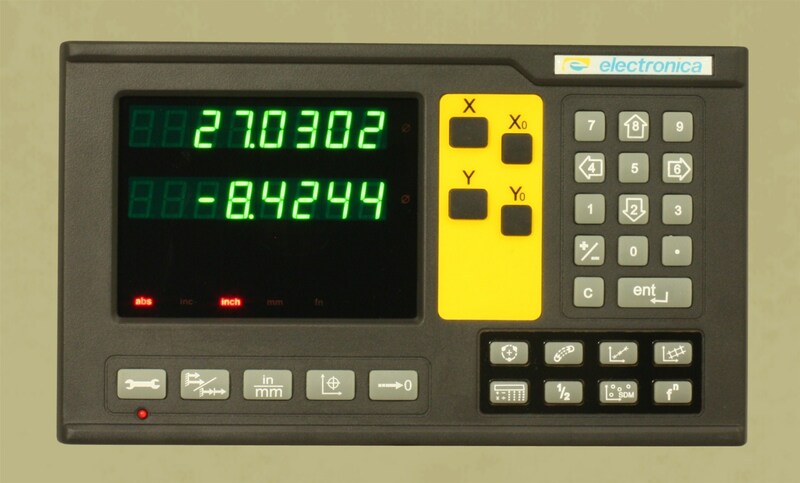 LCD displays are much like a computer screen, and can graphically draw functions in color, allowing you to see what you programmed, before you cut it. 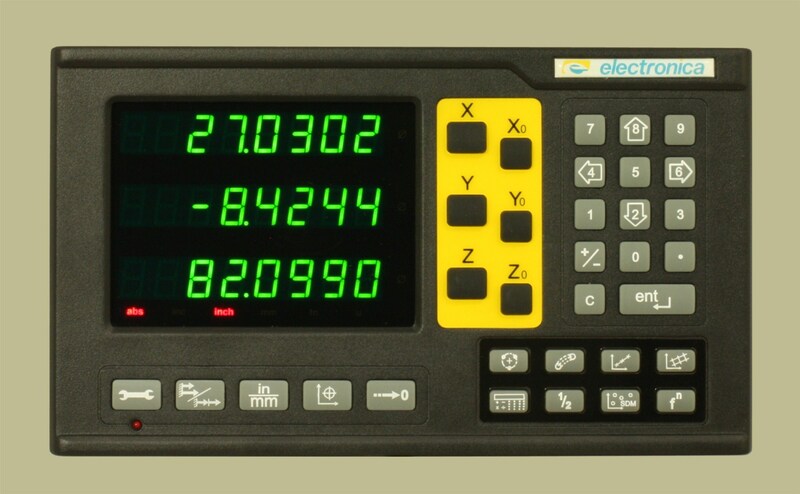 Our EL700 display interfaces extremely well with our touch probe, making it our best DRO display ever! Magnetic scale technology combines the best of optical and inductive technology. Just like inductive or "ball scales", magnetic scales are impervious to coolant or liquid, yet are slimmer, and cost half as much! They're easier to mount, more durable, and on par pricewise with optical scales. In summary, magnetic scales combine all the advantages of the other technologies, without retaining the negative qualities of being higher priced, or difficult to install, that inductive or "ball scales" suffer from. If that wasn't enough, the Electronica bracket kits are the best we've ever seen. 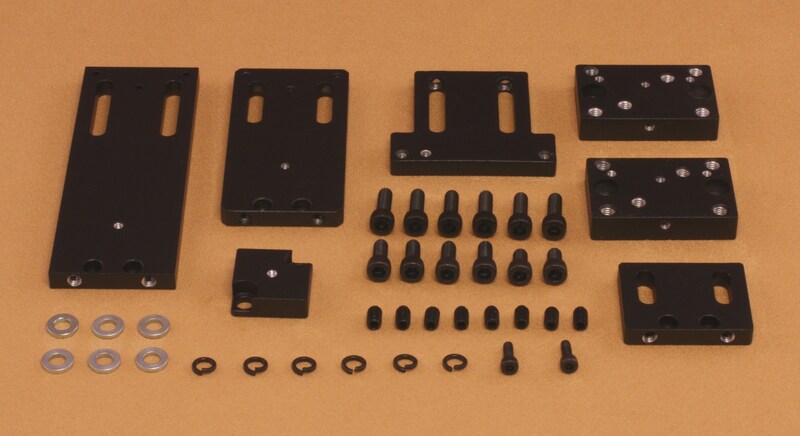 Unlike the competitors bracket kits, Electronica brackets are individually machined for accuracy, not cast. 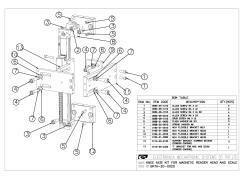 Our Library page includes a complete parts list and exploded assembly diagram - in short, no more missing parts or time consuming "how does this bracket fit together" sessions! The DRO PROS brand of digital readout (green display) represents our never ending quest to bring our customers the best value, professional grade digital readouts on the planet. 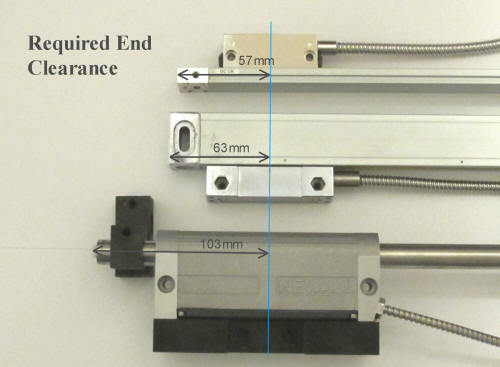 These glass scale kits comes standard with 5 Micron (0.0002") scales and can be upgraded to 1 Micron (0.00005") resolution if desired for only $50 more/scale. 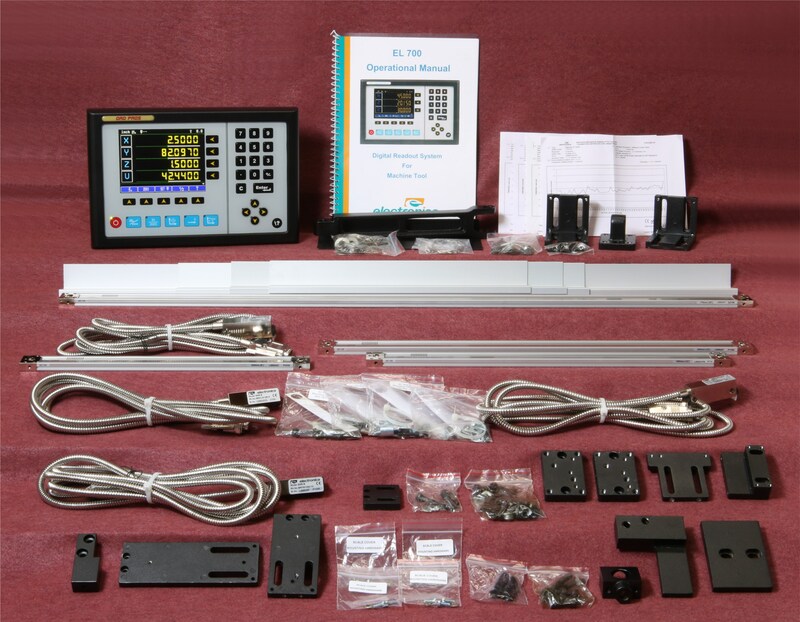 The kit includes FULL COLOR Owners and Installation manuals, a 3 Year Warranty, FREE training DVD (mill kits only), Linear and Non-Linear Error Compensation, and of course, the best customer service in the industry! And in these tough economic times, while other companies are raising prices, we're lowering them! 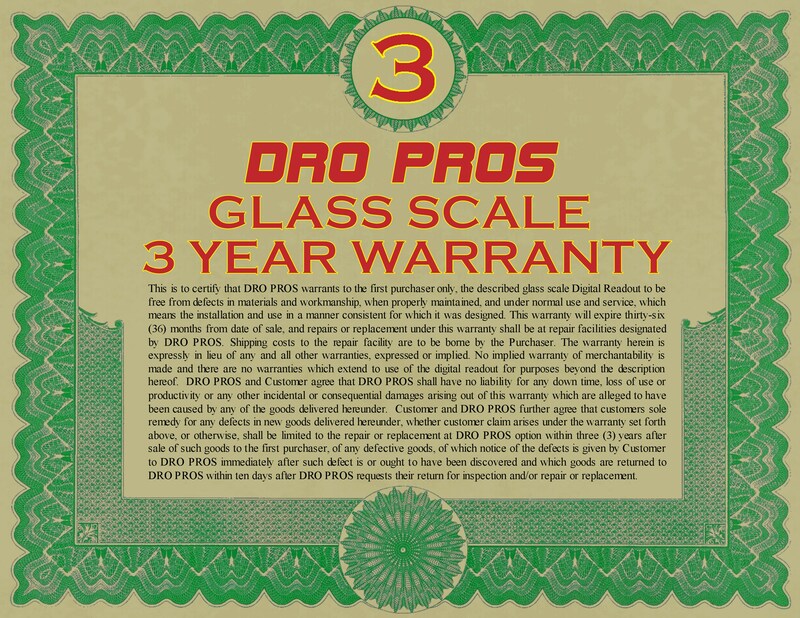 The DRO PROS kit price now includes scales up to 40" at no additional cost! At DRO PROS, we want to be the digital readout company you can count on. Call us now, toll free, at 1-877-628-6028 and experience the DRO PROS commitment to excellent customer service! Magnetic scales are the best - cut to length and can't be contaminated! 12" x 30" x 16"
12" x 36" x 16"
18" x 40" x 18"
12" x 30" x 16" x 6"
12" x 36" x 16" x 6"
18" x 40" x 18" x 6"
- The display does not have "Quick Zero" buttons like the 400 model. - The lower eight function keys are not mill specific like the 400 model. 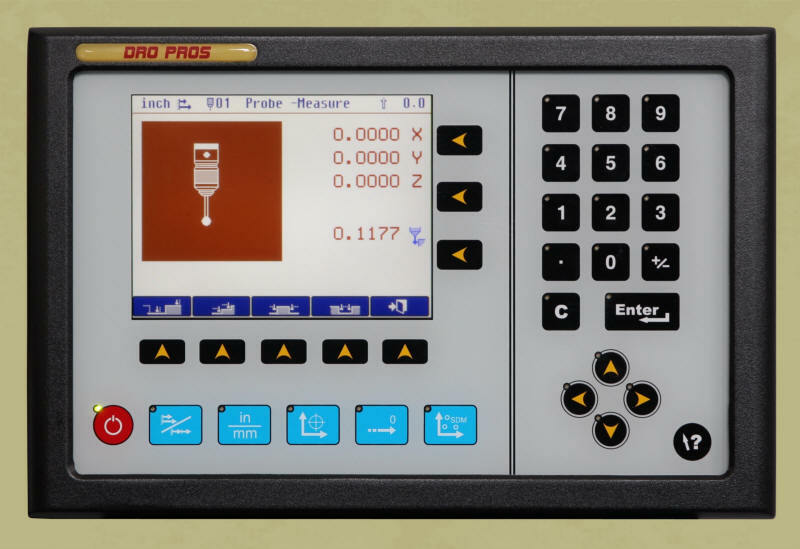 - The 300 model does not have a "Touch Probe" port like the 400 model. 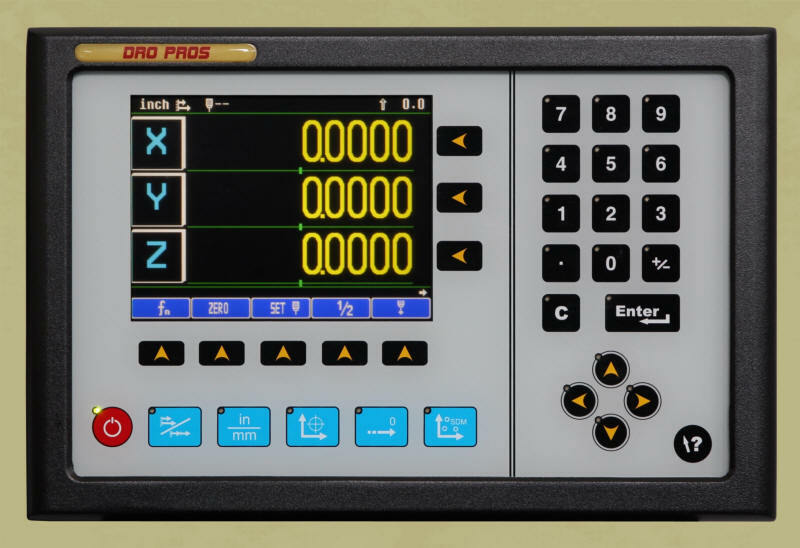 - The front display has "Quick Zero" buttons for the X, Y and Z axis. - The lower eight function keys are mill specific. - Includes an interactive "Touch Probe" port on the back. - Z axis Summing Function. - Our most powerful, brightest display! NOTE: Items are shown out of their protective boxes to better illustrate what's included. Display cover, and installation instructions included but not shown. All kits ship in original factory packaging and boxes. Magnetic Scales can be easily cut to length and can't be contaminated! - The proper terminology for describing a lathes axis are X and Z. - This display has X, Y and Z buttons on the front panel. - Only the X and Y keys and display windows are functional. 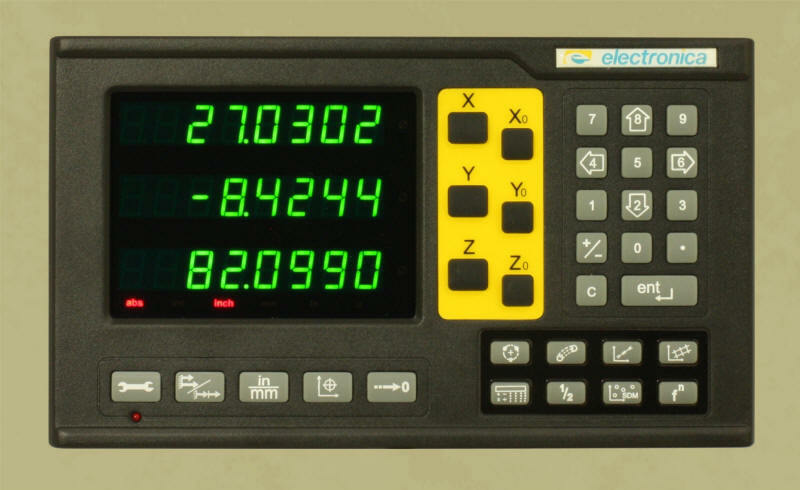 - The back of the display only has connections for the X and Y axis. - The lower eight function keys are not lathe specific like the 400 model. - This display has the 'proper' X and Z buttons on the front panel. 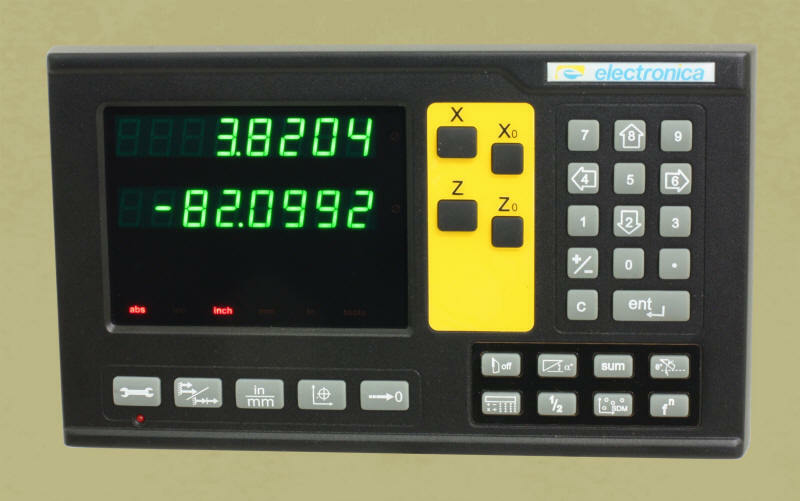 - The back of the display has the proper connections for the X and Z axis. 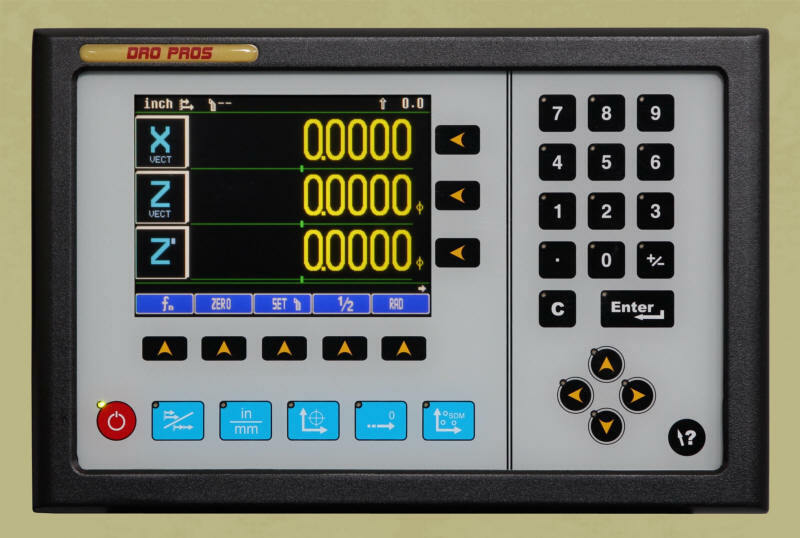 - The front display has "Quick Zero" buttons for both the X and Z axis. - The lower eight function keys are lathe specific. 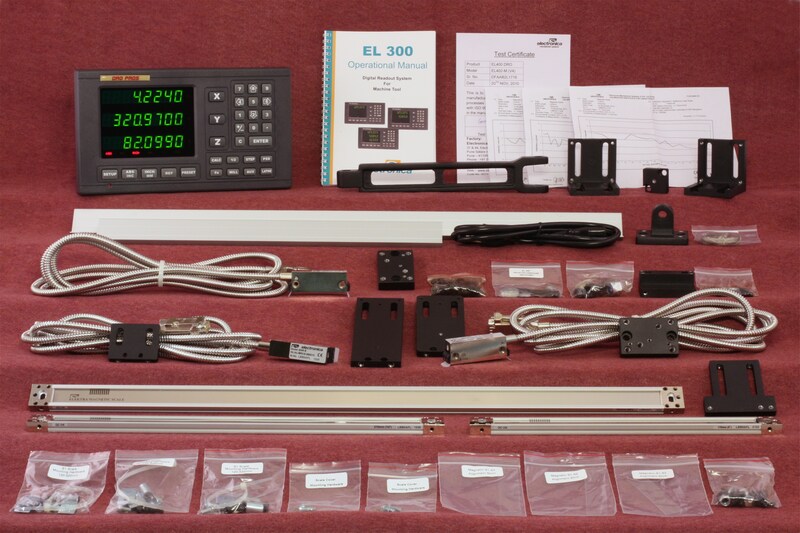 The 300 display is a "universal" display. In other words, whether it's put on a lathe, a 2 axis mill or even a 3 axis mill, it's physically the same display. The display always has X, Y and Z keys, even if it's for a 2 axis mill. 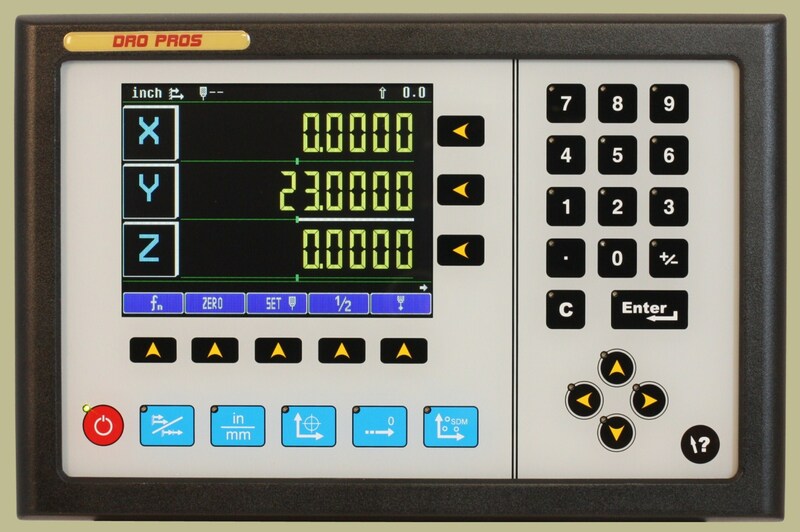 The buttons, or keys, are not lathe or mill specific, although the display can perform most all of the same functions as its big brother, the 400. Instead of machine specific keys, however, you must navigate the menu to find specific functions. 400 displays are all "machine specific". In other words, the mill and lathe displays are distinctly different. The axis keys (X, Y and Z) specifically match the machine. The function buttons, or keys, are also machine specific, which makes for a more intuitive, easier to use interface. The yellow front panel also adds "one-touch zero keys" the 300 does not have. 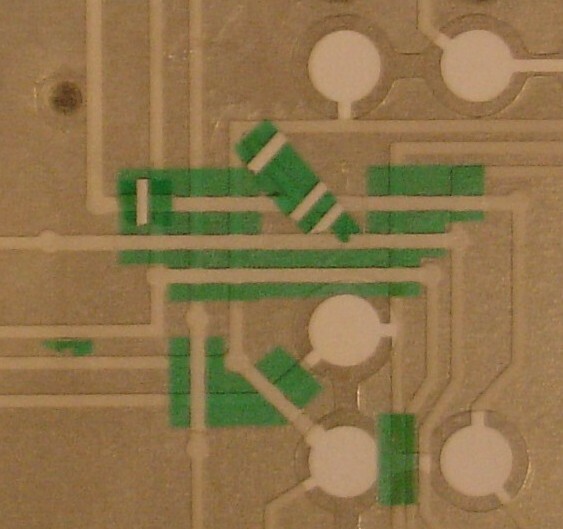 Additionally, the back of the 400 has a contact probe input jack. 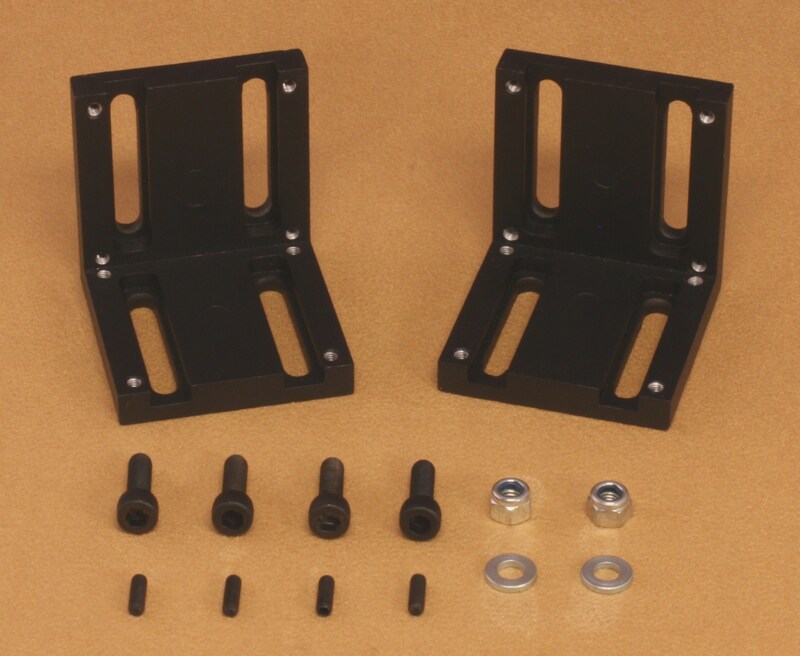 Bracket system Powder coated black, custom brackets "Universal brackets" require extensive modification Complicated bracket system must be "offset"
There are currently three different scale types available for digital readout systems. They are magnetic, glass, and inductive. Glass scales rely upon an optical encoder and receiver mounted inside of an aluminum extrusion. If the scale becomes contaminated by coolant, oil or dust, they are rendered useless. Inductive scales are impervious to contamination. The disadvantages are they're bulky, expensive, and difficult to mount. Magnetic scales combine the best of optical and inductive technology. Magnetic scales are impervious to coolant, liquid or dust, yet are slimmer than either of the other two technologies. They're easier to mount, more durable, and can be broken down into convenient lengths for shipping. The first thing customers notice with magnetic scales is that the readhead and the scale are completely separate components. This means mounting magnetic scales is easier than any other type scale - since the readhead mounts separately from the scale, mounting is much quicker, and a whole lot easier! Prior to Electronica, magnetic scales were prohibitively expensive. Today, they are on par pricewise with optical scales. In summary, magnetic scales hold all the advantages of the other technologies, without retaining the negative qualities of being higher priced or difficult to install that inductive scales suffer from. Picture of a new glass scale. Notice the mirror finish along the walls inside the scale. Picture of a glass scale contaminated by hundreds of debris particles after being placed in service less than 3 months. The inside of this scale should be a mirror shiny finish, as shown above. Even a single bit of debris can cause a glass scale to stop reading correctly. Unfortunately, a contaminated glass scale will continue to display position, albeit an incorrect one, leaving the operator unaware of the malfunction. The solution, of course, is to use magnetic scales. Magnetic scales are designed to operate in the harshest and most extreme environments. Not only are magnetic scales unaffected by debris or contamination, they're also protected against submersion in coolant or liquids. The height or head dimension of the readhead is critical to a clean DRO installation. Magnetic scale technology eliminates the bulky optical sensors common to traditional readheads. A slim design means the readhead can be mounted close to the machine, increasing travel and tool efficiency. Slimmer profile readheads are also much less likely to get damaged from dropped tools or workpieces. 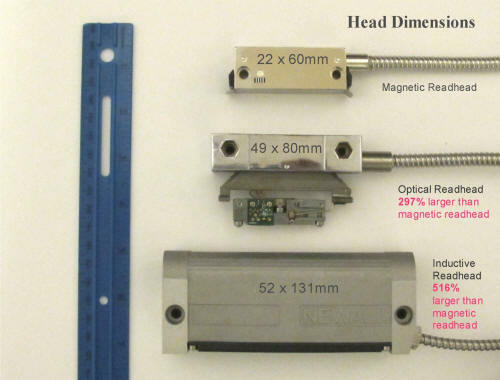 Magnetic readheads retain the advantage of being impervious to coolant, but aren't bulky or expensive like inductive or optical scales. 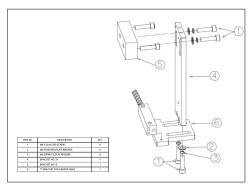 The overall required mounting height is much less than optical or inductive scales. Magnetic scale height is less than half that of inductive scales. "Required End Clearance" is the 'dead space' between the center of the readhead and the end of the scale. The more "Required End Clearance" a scale requires, the longer the scale becomes. How Do I Choose the Right DRO Kit? To start with, all DRO PROS products are quality built to do the job right. However, with that said, each brand has it's own unique advantages. We know that choosing a DRO kit can be difficult, so in our endeavor to help our customers we've developed the following guidelines. While we try to be as impartial as we can, our interaction with our customers and their feedback has certainly influenced us greatly in forming our "opinions". Please keep in mind that every installation is different, only you can know what's best for you. PROS: The most technologically advanced DRO kit on the market today. For starters, the Electronica kit uses magnetic scales. Magnetic scales are impervious to coolant or liquid, and are slimmer than glass or inductive scales. They're easier to mount, more durable, and can be cut to any length you need. They can't be contaminated, and measure only .4" thick. 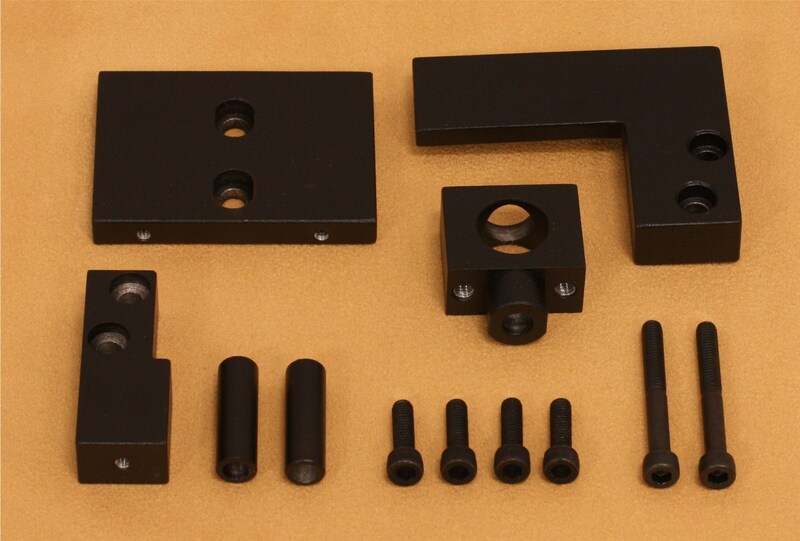 The bracket kits are exceptional, being machined, not cast, and are anodized black for a professional finish. CONS: Such an incredible deal you may end up buying more than just one! COMMENTS: DRO PROS hits another home run! Affordable, built to last, and one of the best looking, easiest to use displays we've seen. WHY YOU WOULD CHOOSE ELECTRONICA: If you value quality, ease of installation, and don't want your scales to get contaminated, this is the kit for you! PROS: Professionally built, hands down it's the easiest DRO to use on the planet. This display uses traditional glass scales, and you can choose between the standard 5 micron (0.0002") or optionally upgrade to 1 micron (0.00005") scales. Lathe kits automatically include SlimLine scales for the cross slide. Covered by a 3 year warranty. Includes the best manuals in the business - completely re-written, English authored, full color Operators and Installation manuals. 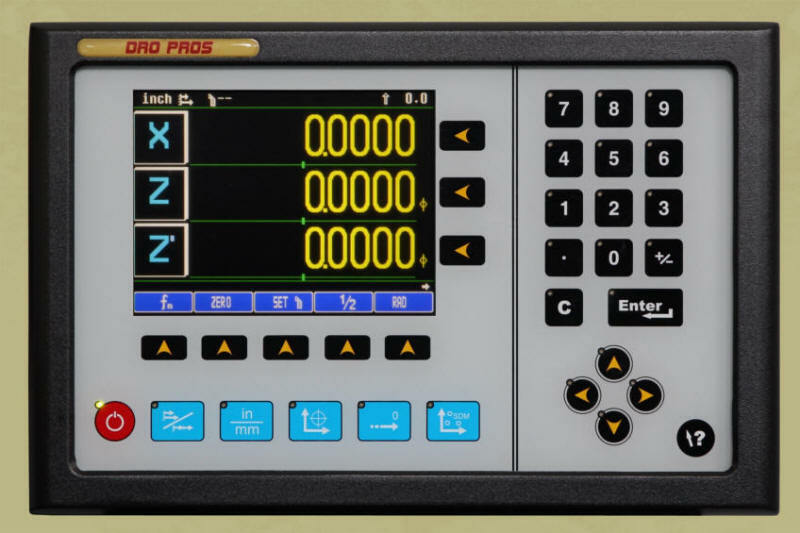 Unlike the lower priced Easson displays, the DRO PROS displays are machine specific, i.e. 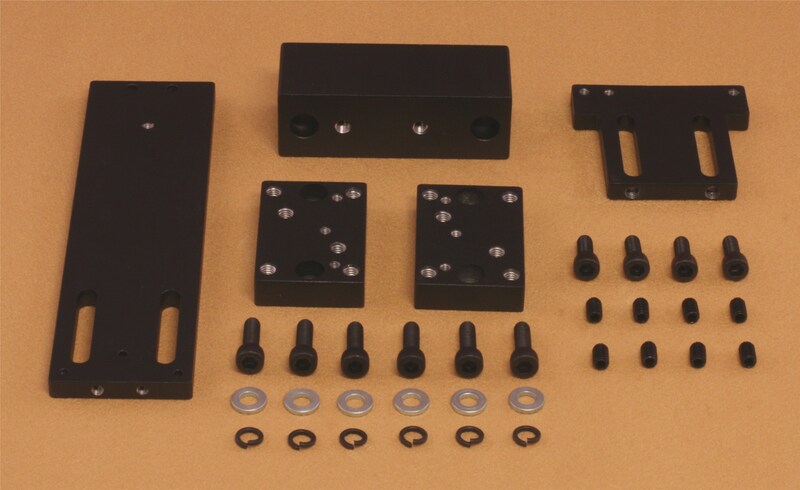 the 2 axis mill kit axis are properly labeled as X & Y; the 2 axis lathe kit axis are properly labeled as X & Z. All Mill kits include a professionally produced DVD that clearly explains all functions. CONS: Glass scales can break or get contaminated. COMMENTS: Affordable, built to last, and one of the easiest to use displays we've seen. WHY YOU WOULD CHOOSE THE M SERIES: If you've been waiting for an easy to use but still affordable Digital Readouts, this is it! PROS: The strongest advantage of the Easson is it's budget friendly price. This display uses traditional 5 micron (0.0002") glass scales. Most all of the Easson's functions (i.e. bolt hole, line hole, centerfind etc.) have dedicated function buttons on the front. This makes Easson a truly "walk up and operate" type of digital readout. Covered by a 1 year warranty. Repair and parts are both available directly from DRO PROS, unlike many other resellers that send customers overseas for all "repair and warranty" issues. CONS: Glass scales can break or get contaminated. Does not include the training DVD. Operators manual has been translated, and at times can be confusing. Lathe display is not machine specific, i.e. the two axis are labeled X & Y, not X & Z as would be proper. SlimLine scales not offered for the lathe display. 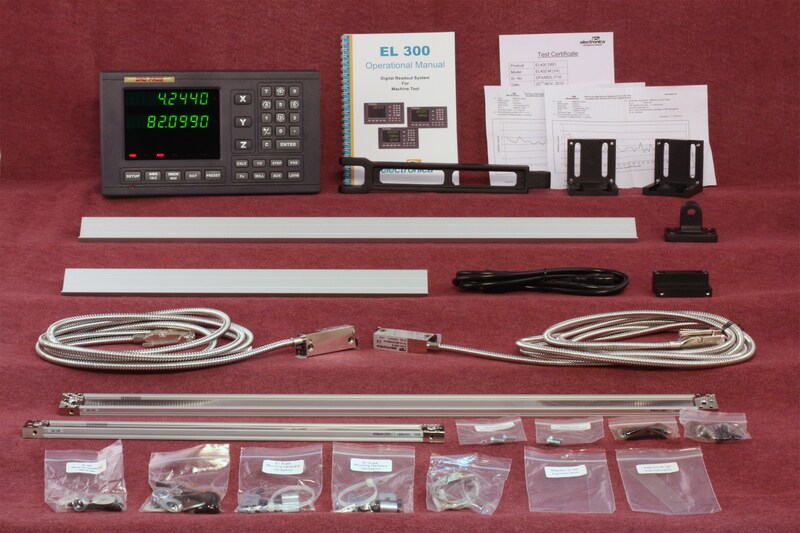 COMMENTS: Easson has been producing Digital Readouts for over 20 years now, and continues to be a top seller. WHY YOU WOULD CHOOSE EASSON: You are an experienced machinist and probably wouldn't watch the DVD or look at the manual anyhow. PROS: Fagor enjoys loyal brand name recognition. The build quality and packaging of the kit is good. CONS: Expensive. Glass scales can break or get contaminated. Fagor's Innova display is a smaller, more compact display, so most of the functions are accessed through a push-button menu driven system. Some users find this design frustrating and difficult to use. The comment we hear most often is "Sure do need to keep the manual close by". COMMENTS: We feel the Fagor Innova series could use a redesign of the front panel, especially adding more function buttons. WHY YOU WOULD CHOOSE FAGOR: You've used Fagor in the past and don't want to change, even if the alternative is cheaper and easier to use. SUMMARY: Fagor is a quality built DRO, but is being challenged by many less-expensive, easier to use DRO's. But I can still save $5 and get an eBay special from some guy I can't understand or talk to! Yes, we understand. We all want to get 'a bargain'. But trust us, you don't want to go there. Besides the fact you can't talk to these guys if you have a question, they don't provide a written warranty, if something breaks you can't get replacement parts, etc. etc, might we suggest you consider the quality of the manual? So if this is the easiest to explain function, how well do you think their manual explains ARC procedures? Remember, the very first moment you have a question, DRO PROS customers are going to call our toll free number and get the issue resolved immediately with an English speaking American. Our competitors customers are going to wonder what in the world they were thinking when they saved $5. You be the judge! 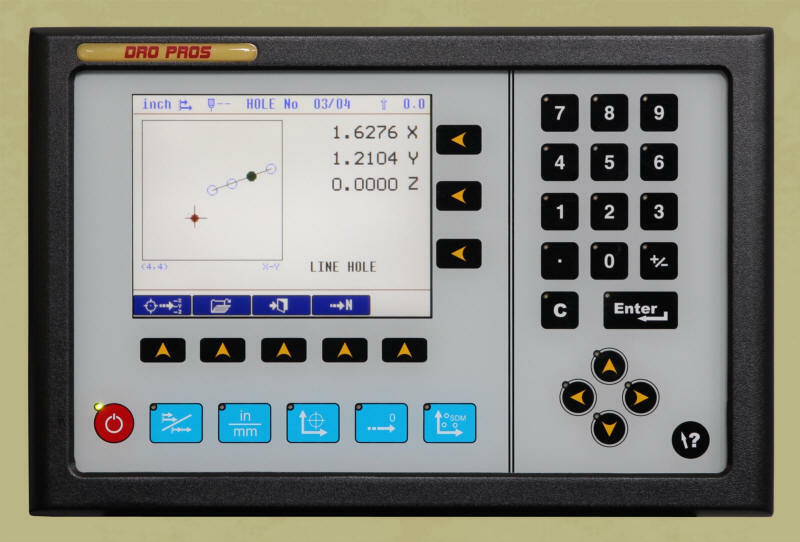 This video illustrates how to measure and choose scales for a digital readout. Attention is given to illustrate the different parts and mechanical limits of a digital scale. 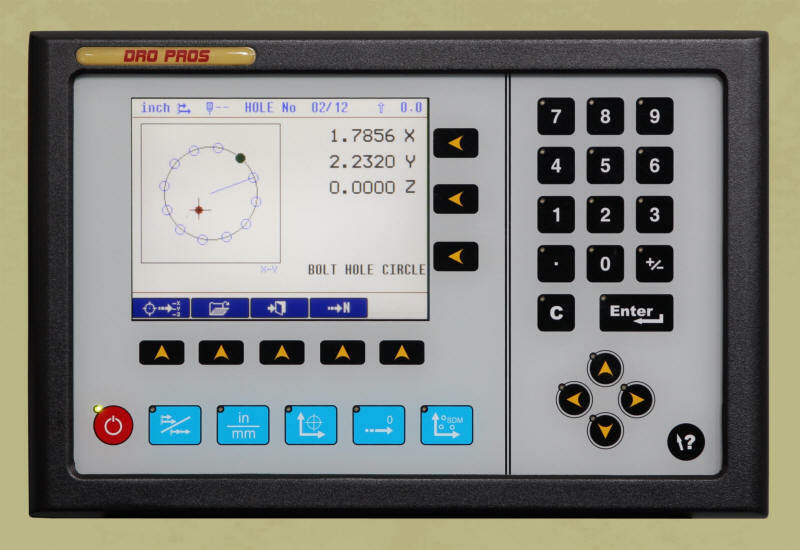 Rounding a corner or machining an arc on your workpiece has never been easier. 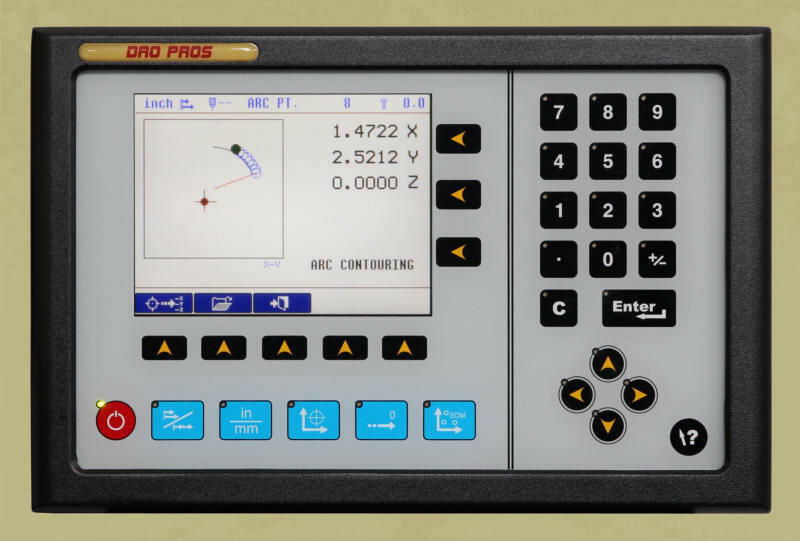 The Easson ES10-3M5 digital readout makes it easy, follow along as it puts an outside radius arc on our workpiece! This DRO PROS video demonstrates the 'Bolt Hole' function of an Easson ES10-3M5 digital readout. Bolt Hole, or PCD (Pitch Circle Diameter) allows an operator to place a series of holes evenly around a central point. Have you ever had to angle your workpiece on your mill table? This video demonstrates how you can accurately position the workpiece at any angle on the work table. Remember, Incline Tool Position also gives the operator an incline function for machining parts positioned on an inclined surface. 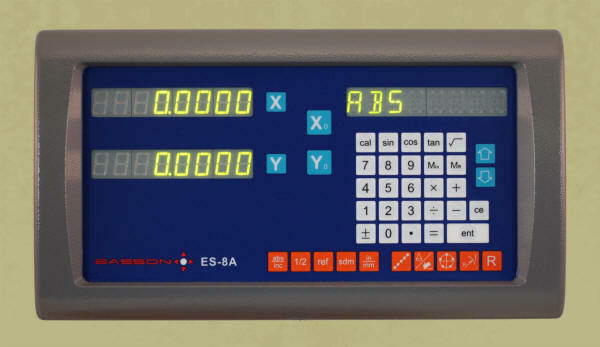 This video gives an excellent overview of the Easson ES10 digital readout. Display functions and setup parameters are covered. Are you doing any sort of repetitive machining? Wouldn't it be great to be able to create exact copies of your original workpiece? Well now you can - either enter your points as you move to them on your workpiece or simply enter them in a list format - the choice is yours! This video demonstrates the 'Line Hole Position' function. This capability is used to place a series of holes in a straight line, even when canted at an angle. Although setting up the ES10 is already quite easy, this video makes it a snap! All setup parameters are explored in detail, making setting up your DRO easier than ever! 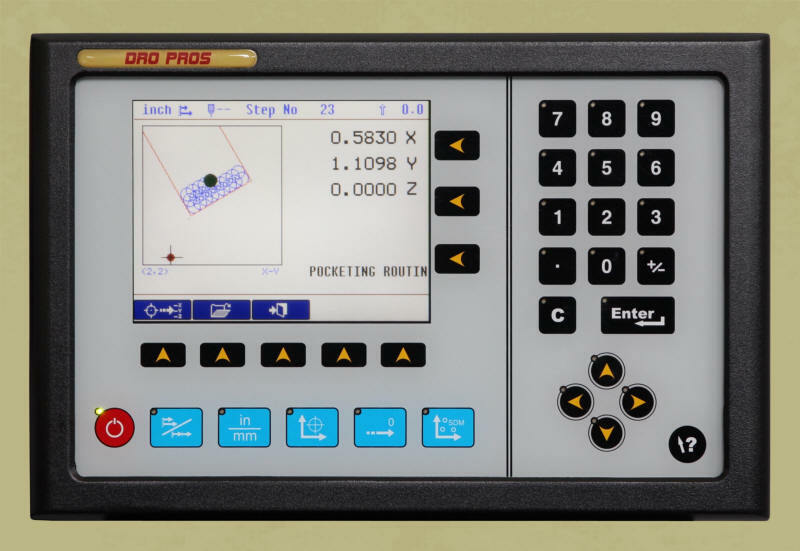 Demonstrates how to recover the zero point of your workpiece after a power loss or the table is accidentally moved with power off. 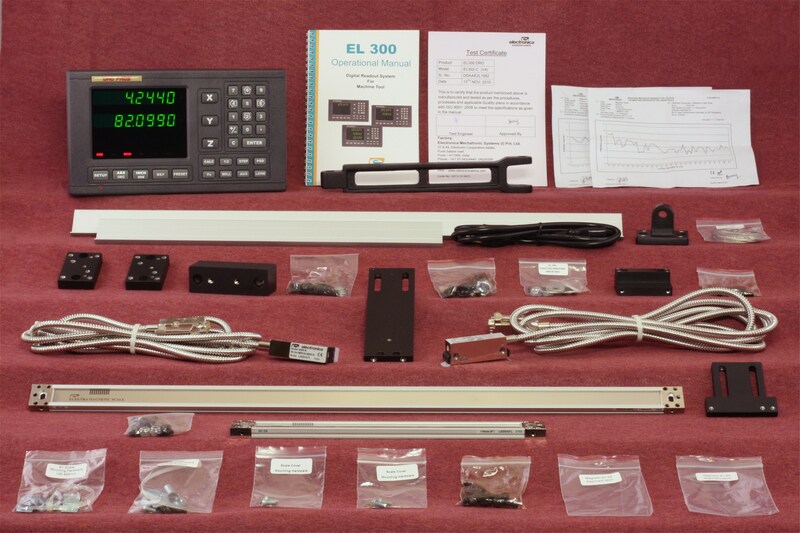 This video illustrates the centerfind feature of an EASSON ES10 digital readout. Easily locate the center of your workpiece with the ES10! Is your scale reading in the wrong direction? This video illustrates how to reverse a digital scales 'read' direction. What makes DRO PROS readouts the best? Am I really getting a good deal? 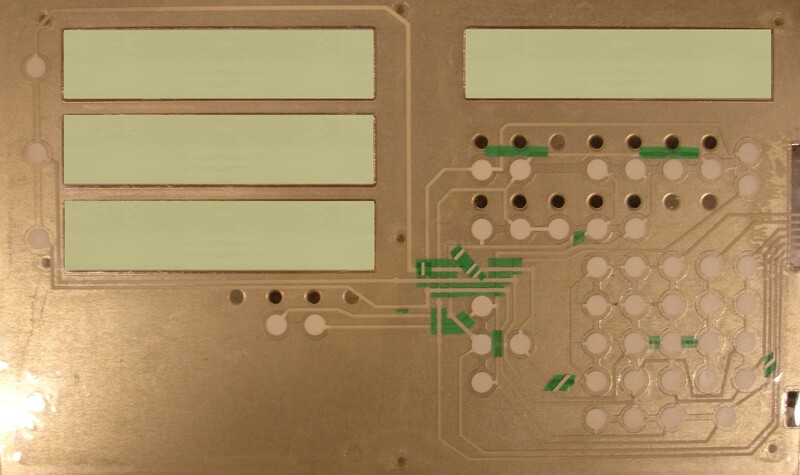 Notice how the traces between the touch pads are simply taped in place by hand from leftover scraps - obviously this is much cheaper to manufacture, but how do you suppose this type of display is going to hold up on your machine? As they say, Caveat Emptor or 'Buyer Beware'. 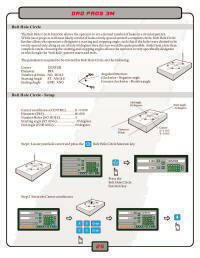 Hopefully this information will help you, our Customer, when choosing your DRO system. Take your time, choose wisely. What can a DRO do for me? 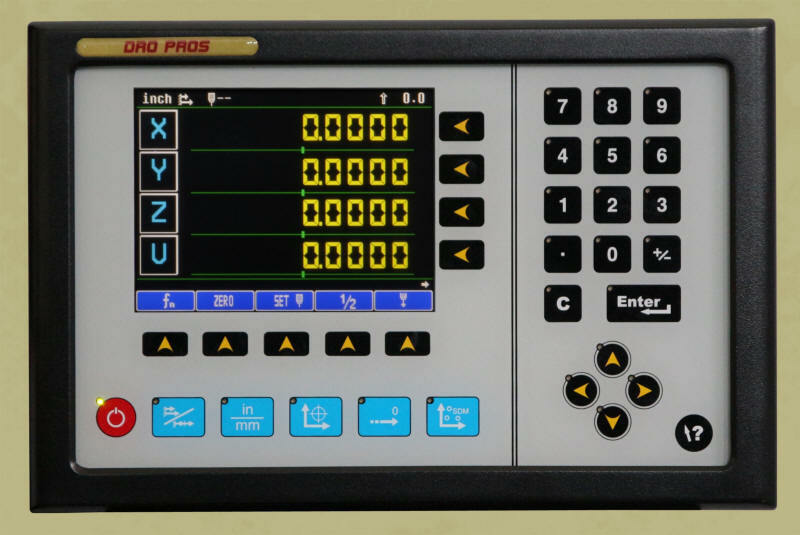 A digital readout system digitally displays a machine tool's exact position on an electronic display board. 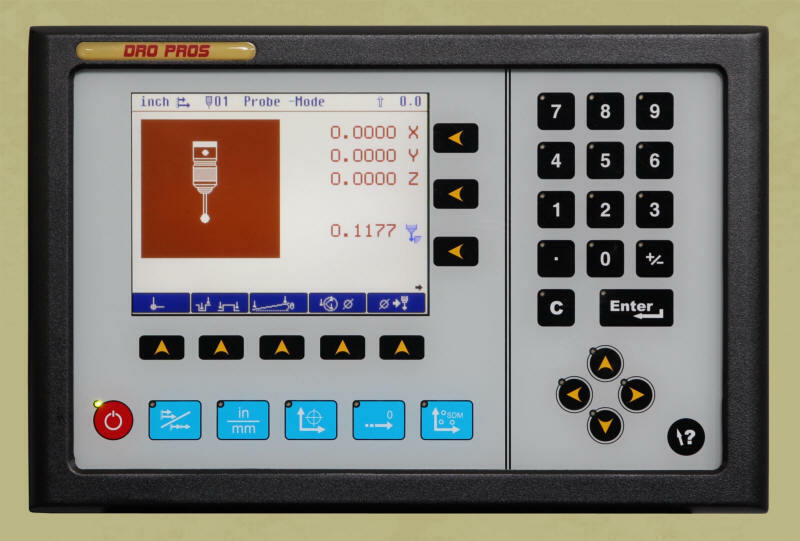 A DRO can greatly simplify your work, save time, reduce costly mistakes and allow you to produce more accurate, exacting parts. The DRO unit keeps precise track of tool bit position in all 3 axis - back and forth (x axis), fore and aft (y axis), and up and down (z axis). Without a DRO system, an operator must count the number of hand wheel revolutions to determine exact position of a tool head against the table. 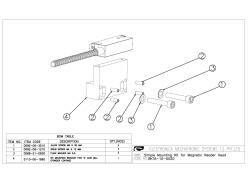 For example, some milling machine leadscrews are graduated at 16 threads per inch (TPI), which means that for every turn of the hand wheel the table moves 1/16? (.0625), therefore it takes 16 turns to move the table exactly 1?. Other machines are calibrated at 10 TPI, meaning it takes 10 hand wheel revolutions for the table to travel an inch. On the Z axis, it is typical for each division to represent .002?, where one full revolution is equal to .060?. Needless to say, it can quickly become quite confusing! The bottom line is that with a digital display, the days of counting hand wheel revolutions are over! 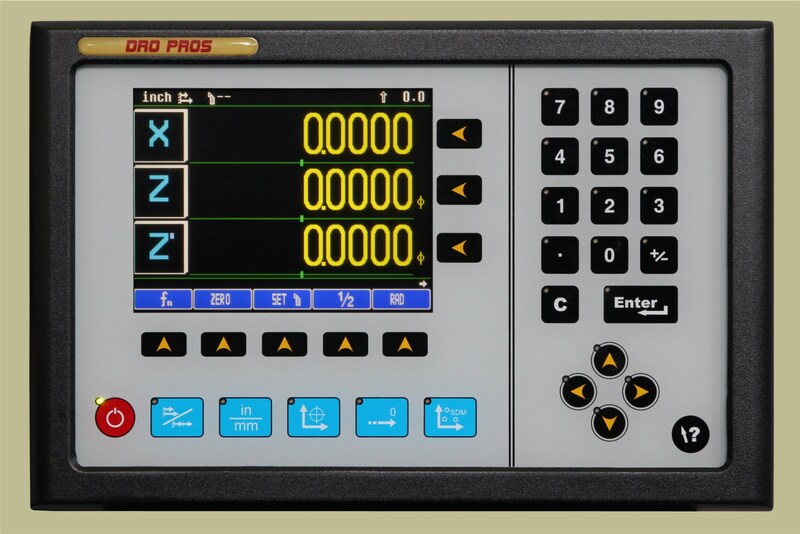 In summary, a machine equipped with a digital readout (DRO) is easier to use, less frustrating, and can save the operator many hours in setup and operation time. No more counting turns of the dial - simply turn the display on and you're ready to go - the DRO keeps track of position even after a power shortage! 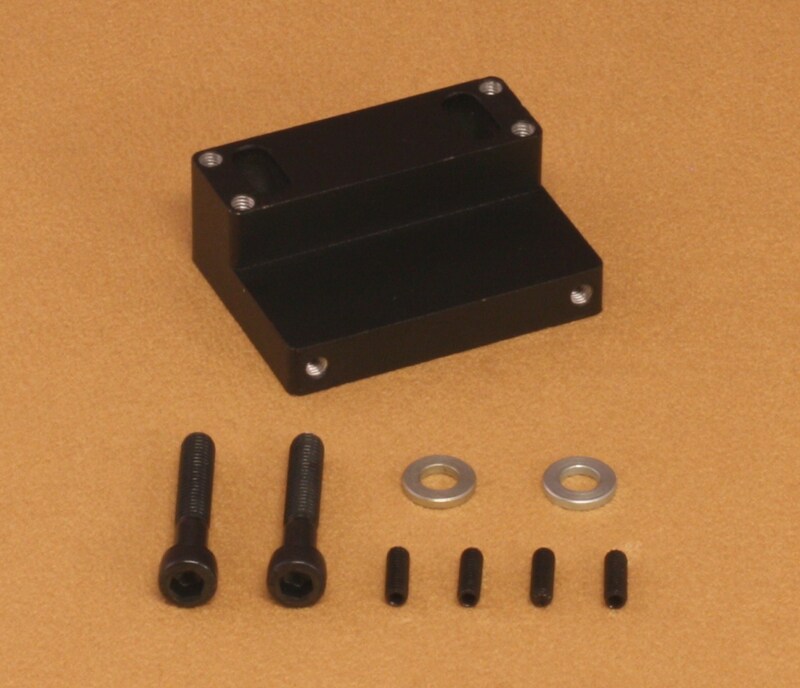 A majority of our sales are in the form of kits, but we also sell individual components too. We sell DRO parts for Lathes, Milling Machines, Borers, Grinders, Wirecut Machines and EDM's. 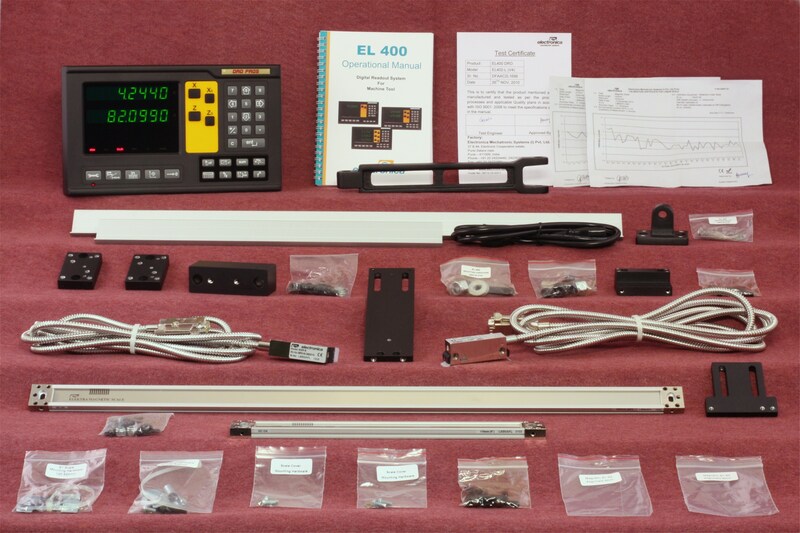 If you simply need a replacement scale for your existing display, odds are we can help. 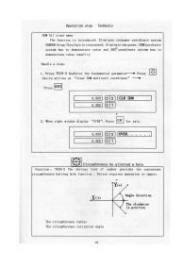 Most scales are wired universally, for more information please check our scales page. At DRO PROS, we only sell true five bearing glass scales with our readout kits, and with over 70 different size scales to choose from, we fit your machine right! For .0002" resolution scales up to 39.3" in capacity (models 100mm - 1000mm), the scales are included in the price of the kit and there is no surcharge. Simply tell us what size scale you'd like and we'll send the correct length scale. For scales greater than 40" capacity (our oversize scales), there is a small surcharge based on length when purchased with a kit. Why does DRO PROS post their digital readout part prices online when other companies don't? when you need them, you might not buy their digital readout kit in the first place! At DRO PROS, we're proud to show off our low part prices. Why should you buy from DRO PROS? Veteran owned, Veteran managed - and proud of it! Price. Probably the most talked about factor when buying a digital readout. Price can also be the most misleading, and perhaps worst way, to judge a digital readout kit. We've all heard the old adage, "You get what you pay for." Before the internet, it was true, price did generally correlate directly to value. But that was yesterdays economy. All resellers obtained their goods the same way, and therefore incurred the same costs. In today's economy, the market has changed drastically. At DRO PROS, we import and sell directly to you. Unlike our competitors, we do not have Western and Eastern sales divisions and multi layers of management to support. One location, one cost, and the savings get passed on to you! Intuitiveness or "Ease of Use". Probably the most important, and hardest to determine factor when buying a readout. Think in terms of after the sale. Even if you get an absolute 'rock star' bottom line price that would make William Shatner proud, if the digital readout is not user friendly, you still didn't get a 'deal'. The whole point of getting a digital readout is to make your work easier and more enjoyable. If the digital readout is poorly designed, too complicated, if the display isn't bright enough, or in other words is 'user unfriendly', you'll regret your purchase decision every time you turn it on. It simply won't matter what you paid, it's not worth it! Support. Most likely the second most important, and perhaps most overlooked factor when buying a digital readout. Imagine trying to reach a technician when you've bought a digital readout from an overseas reseller! Yet every day, people "save" $50 and buy products on eBay without stopping to think what will happen when they need service or tech support. Some digital readout resellers don't even publish a phone number! While our competitors continue to pare down or even totally eliminate their customer support, we continue to expand our Customer Service. Our Video Tutorials are the best in the industry, and are available free for you, our customers. Our tech help is the best in the business - our techs all know our readouts inside and out. Nobody knows digital readouts like DRO PROS! Warranty. 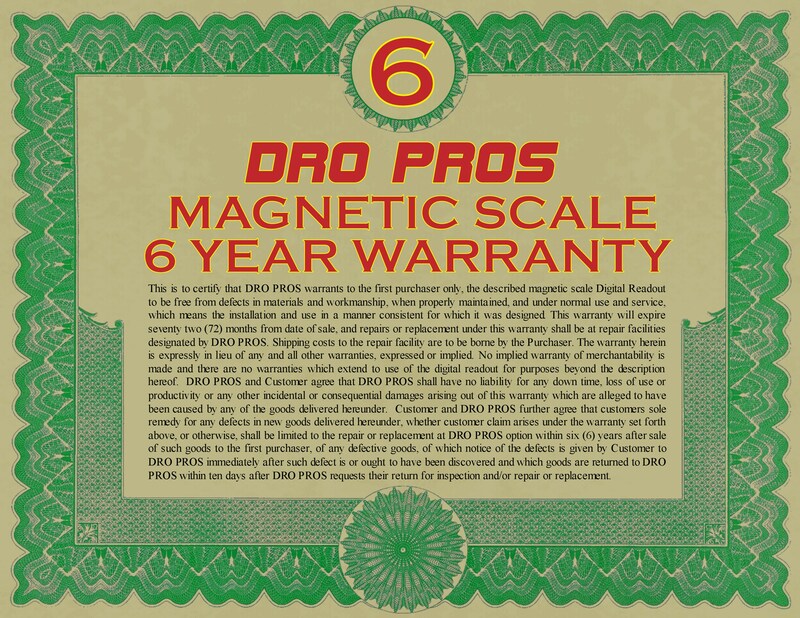 DRO PROS is proud to offer the industries safest, longest, 6 year warranty on all of our Electronica magnetic scale kits. 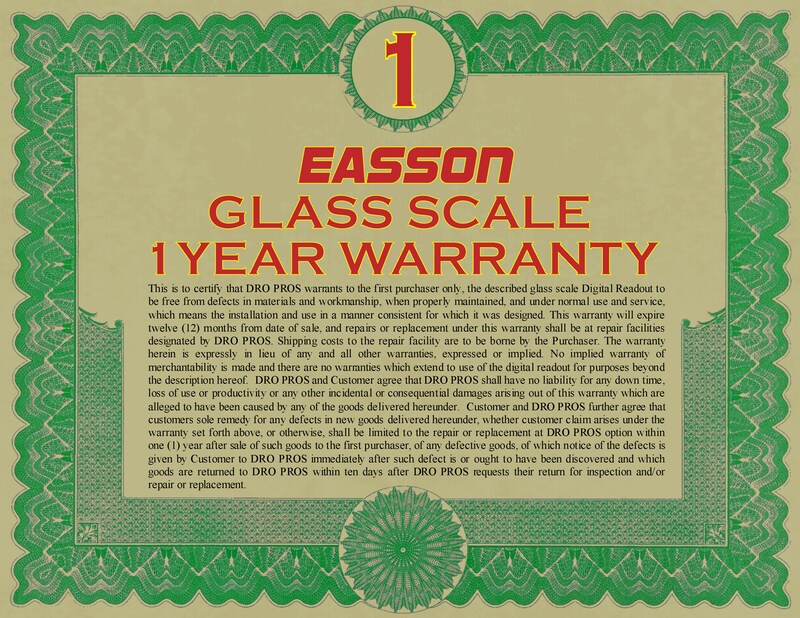 All of our DRO PROS brand glass scale kits come with a full 3 year warranty, and our EASSON kits come standard with a 1 year warranty. DRO PROS brand warranty claims are handled directly by DRO PROS. No run-arounds, no hassle! Something not working as expected? Call us, don't get redirected overseas like the other guys! Parts. Can you believe some resellers don't carry parts? 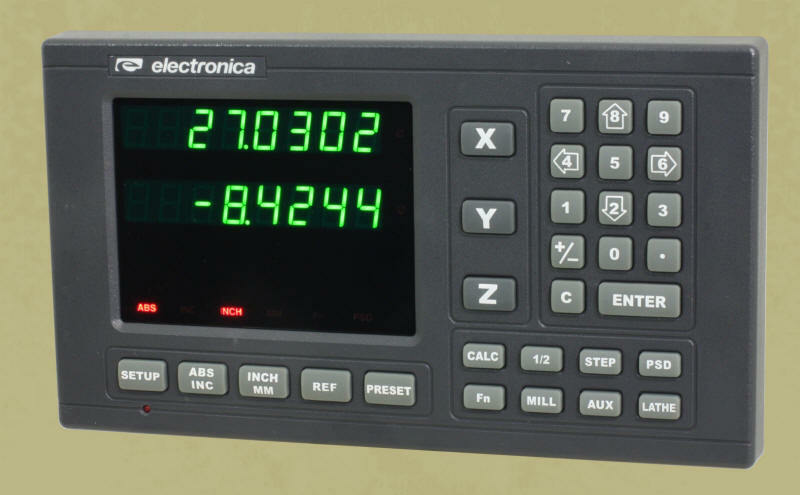 That's right, buy from the "other guys", break a scale, and you get to replace the entire digital readout kit! Don't assume you can just go buy a different brand scale, either, because most manufacturers use different connectors on their scales. If that wasn't enough, even among those with a common connector, such as a DB9, most are hard wired differently. Finally, don't overlook the cost of parts. At DRO PROS, an 800mm replacement scale will cost you $197. A similar scale sold extensively by a European company will cost nearly $700! Finally, we have a massive inventory of parts, so rest easy - a replacement part is only a phone call away! The Best Value. 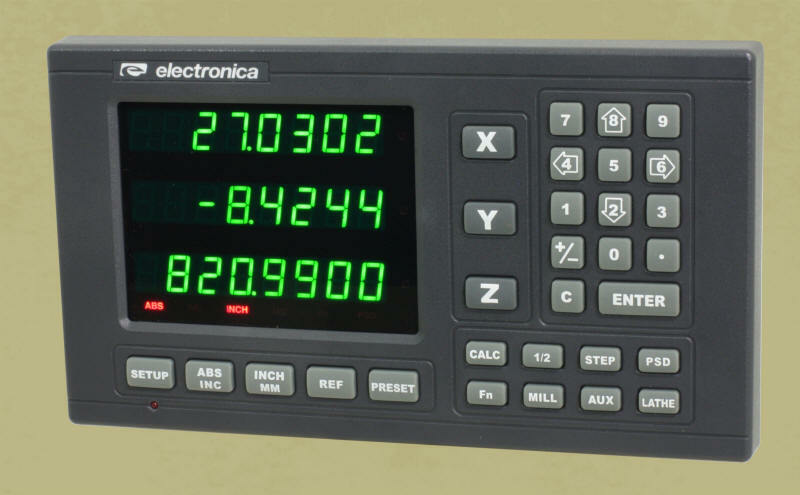 We literally search world-wide for the best value digital readout products on the planet. If there was a better digital readout package to be sold, we would be selling it. Yes, we've seen cheaper units on eBay, but there is a reason they're cheaper. Think poor quality, no parts, no manual, non-existent customer service, poor product fit/finish etc. Customer Service. We pledge to never "over sell" you on a product that won't work well for you. Our philosophy is to try and save you money and get the best value kit tailored to the machinery you have. Many of our customers are surprised when we recommend against buying a more expensive brand. Again, our philosophy is to build customers for life. Give us a call and let us save you money! Shipping. Most orders ship the same day, the next at the latest. We do not 'drop' ship, we have our own massive warehouse of inventory right here on site. We use UPS, you'll get a tracking number emailed to you immediately, and we cover all shipping insurance automatically. The Company. DRO PROS is a veteran owned, American company. We enjoy selling quality products at competitive prices. We believe that providing the best customer service is the key to success. No other company spends more time on the phone with customers than we do. Even in a down economy, our company continues to thrive and grow. We look forward to earning your business! The Bottom Line. 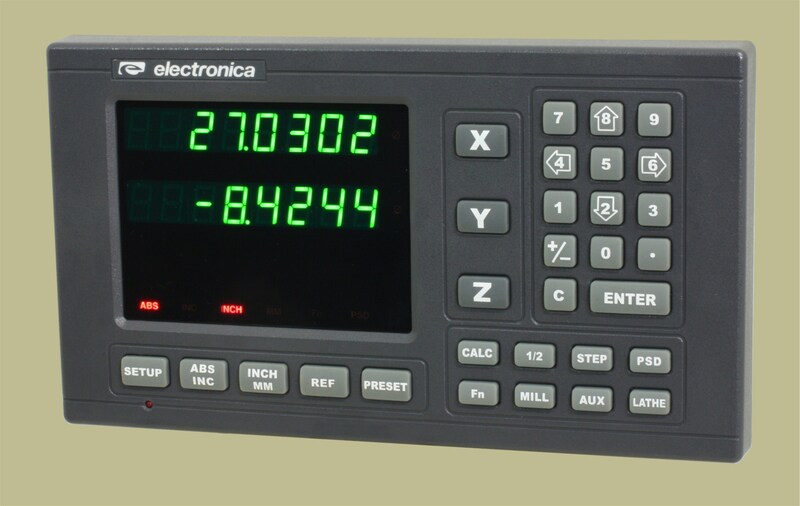 Our line of digital readout's are simply the most user friendly readouts on the planet. Because of our direct marketing structure, they're also extremely affordable. Coupled with our extensive customer service and affordable parts, our Digital Readout products are simply the best value on the planet. Domestic Shipping to the United States: All digital readout shipping is done via UPS for a flat rate of $43. You'll get a tracking number emailed direct to you from UPS, enabling you to track your shipment door to door! We cover insurance against any potential shipping damages, so no hidden fees here! International Shipping to Canada: All of our DRO shipping is done via UPS. We charge a flat fee of $80. International Shipping elsewhere: All of our DRO shipping is done via the United States Postal Service via a flat rate of $140. DRO PROS Industry Leading 6 Year Warranty! DRO PROS brand warranty claims are handled directly by DRO PROS. At DRO PROS, we take care of our customers. Have an issue or need some help? Let us take care of it with a toll-free call to California! 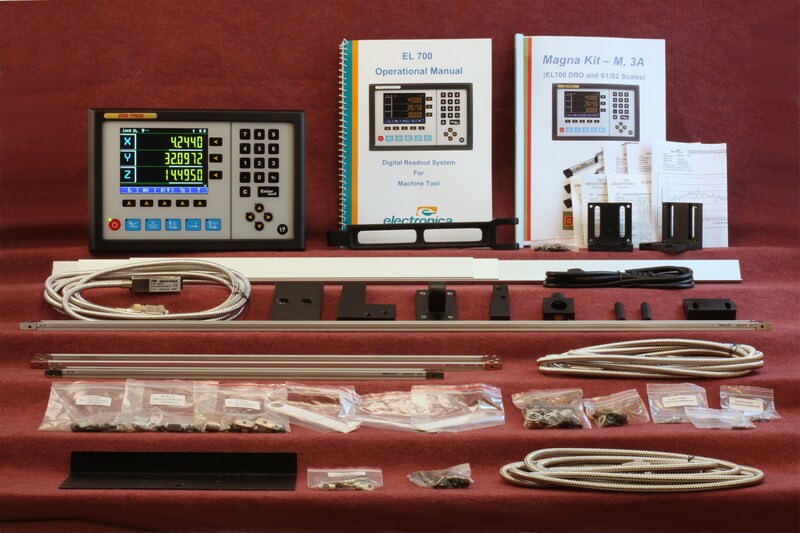 Professional Digital Readout kit packages start at only $499! Call Toll Free now at 1-855-DRO-PROS for all your digital readout needs!